Nest Fresh plasters the Non-GMO Project Verified logo on the front of its free-range egg products, but the only ingredient is a plain chicken egg. Eggs are inherently GMO-free; there are no genetically modified chickens and no genetic materials in chicken feed pass from the chicken to its eggs. Not only is this non-GMO label itself completely unnecessary and misleading, but Nest Fresh’s explanation for using it really puts egg on its face. Nest Fresh implies that buying GM products will increase pesticide use and threaten food security, but suggests that by buying its “non-GMO eggs”, you are helping “protect” yourself and society against those problems. Putting aside the irrelevant non-GMO claim, the evidence actually shows that GMOs do the opposite – they reduce pesticide use and help increase food security, especially in developing countries. So if the claim itself is meaningless, and the reason behind making it runs afoul of the facts, why does Nest Fresh insist on making it? A crowded egg market might do it. In recent years, eggs made a comeback from concerns about cholesterol and now rock a health halo in the minds of consumers across the country. The American Egg Board estimates that Americans each eat 280 eggs a year. With that trend set to continue in 2019, shoppers have countless egg brands to choose from. 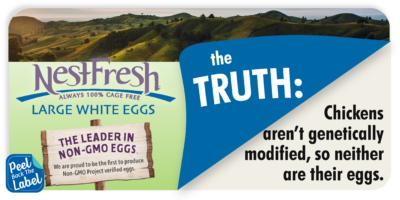 Nest Fresh is attempting to set themselves apart from a crowded market by using a non-GMO label, hoping consumers are unaware that “non-GMO eggs” aren’t a real thing. That’s a real shame. It’s time for Nest Fresh to stop misleading consumers with the non-GMO label and its baseless reasoning for using the label. Maybe if Nest Fresh starts leading with truth and transparency in its marketing, it can begin to unscramble its mistakes. Take some time to call on Nest Fresh to do the right thing and stop confusing consumers. You can send them a note on their Facebook page, Twitter account or via e-mail here.